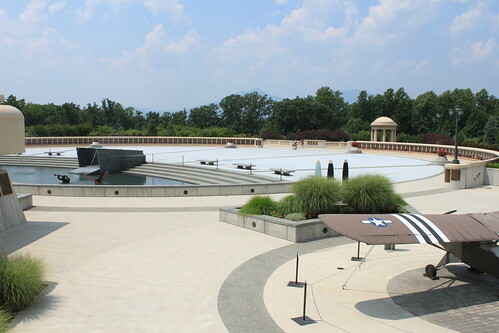 On Sunday, Ryan and I stopped by the National D-Day Memorial in Bedford, Virginia. 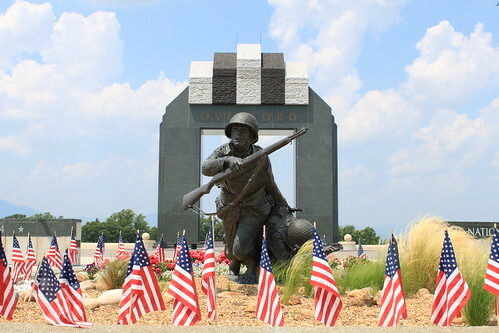 Bedford is a small town near the Blue Ridge Parkway and doesn’t seem like the most likely candidate for a national memorial. The planners, however, paid attention to every single detail. The memorial’s location is no coincidence. On the morning of June 6, 1944, 30 men from Bedford landed on Omaha Beach. By the end of the day 19 were dead. Bedford is a small town now and it was a small town then. 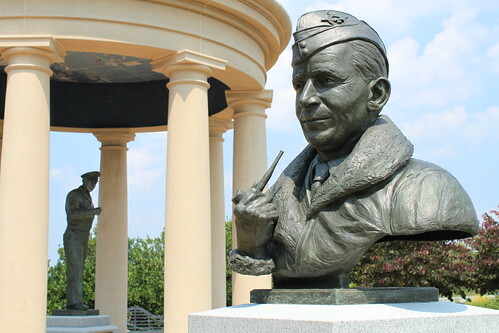 With a wartime population of 3200, Bedford suffered the highest per capita loss that day. 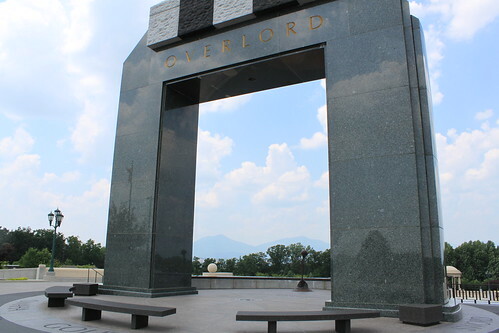 You couldn’t ask for a more gorgeous spot than Bedford– perched at the top of a hill, the memorial has great views of the mountains, including the Peaks of Otter. I think this is the most well-thought out structure I have ever visited. Every detail was chosen for a reason. A plaza separated into five parts represented the five landing beaches. 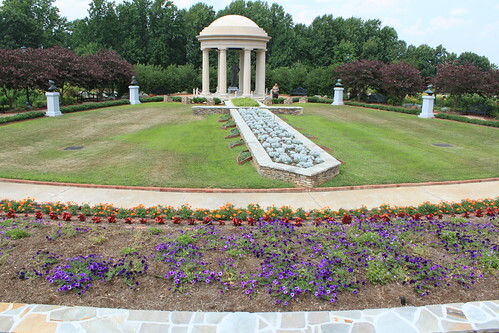 A peaceful garden was actually in the form of the SHAEF seal. 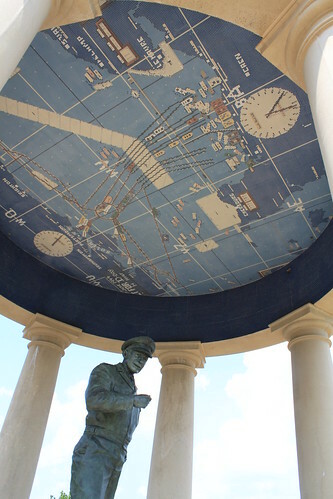 Hidden above a statue of Eisenhower was a replica of the map they used for planning. Marble in the form of Higgins Boats. Bathrooms that looked like pillboxes. 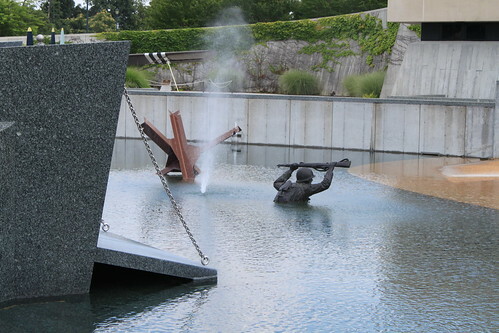 A fountain reminiscent of the scattered gun fire at the beaches. 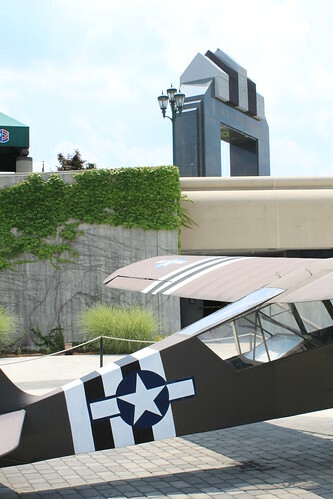 Even the aesthetics of the Overlord Arch were selected to match the stripes the Allies had on their planes. Like I said, the planners of the memorial thought of everything, including traveling pet owners! 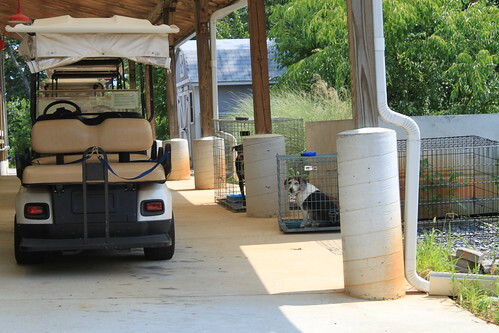 Pets aren’t allowed on the monument, but the National D-Day Memorial has a shaded area with crates and water bowls for your pets to wait. That allowed Jimmie and Henry to sit back and get attention from the gift shop staff, while Ryan and I took in the sights. 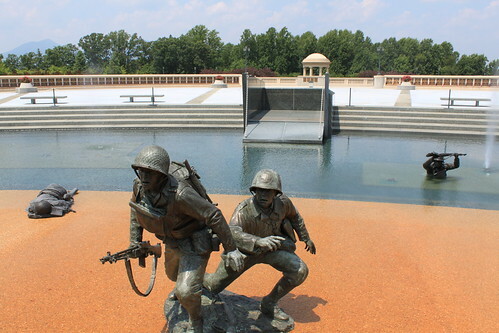 More pictures of the National D-Day Memorial can be found on my Flickr site. 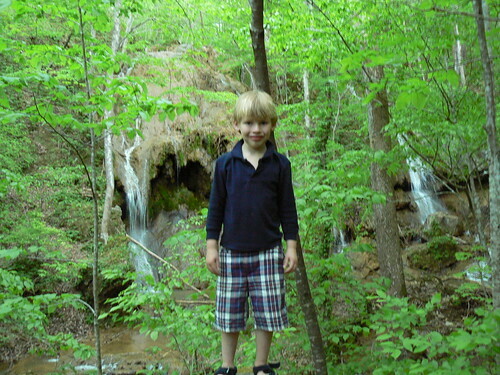 One of my favorite hiking buddies is my friend’s son, Penn. He has been accompanying me on outings for six years now! Penn and his family now live about 11 hours from me, but we got to have a little hiking reunion this past weekend. 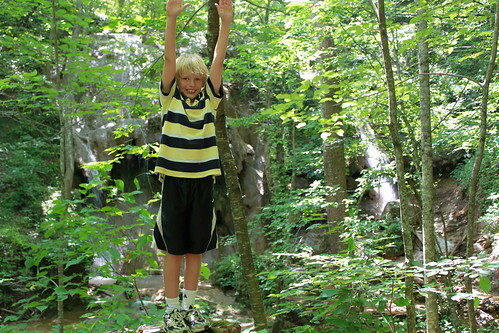 We chose to hike to the Nature Conservancy’s Falls Ridge Preserve near Blacksburg, Virginia. Penn had been there twice before. In fact, I had pictures documenting his previous visits. So it is with great pleasure I get share young Penn in front of the same waterfall on three seperate occassions— Age 2, Age 5 and now Age 8. 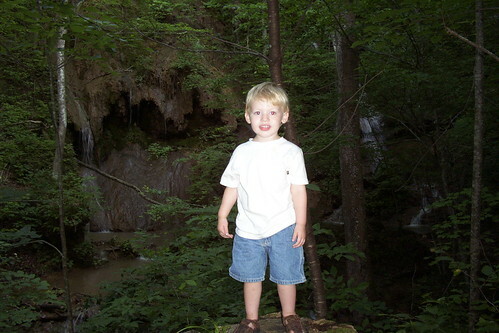 The falls look pretty much the same, but Penn has definitely grown! In recent years, I was exceedingly lucky to have a number of supportive loved ones who helped me make my way to Ryan Somma. One of those individuals is my friend Ann. When it came time for my wedding, I wanted to thank her for her contribution to my happiness. All the laughter she brought me with her stories and observations. The times she let me galvanize my resolve by listening to grievances she had heard dozens of times before. And most of all, the times she made me field tough questions– the kind whose answers are hard to say aloud even though they are surprisingly common-sense. At Ann’s wedding she designed and constructed handbags for each of her bridesmaids. Her creations proved to be so popular that after her wedding, Ann was able to build a business off of her designs. I decided even though the bar was high, that I would like to hand make something as well. I don’t sew and I know very little about handbags. I can, however, crochet. Ann loves daisies, so I scoured the Internet for a daisy crochet pattern. That’s when I found Krochet Krystal. The site shares a free pattern for a beautiful daisy square. 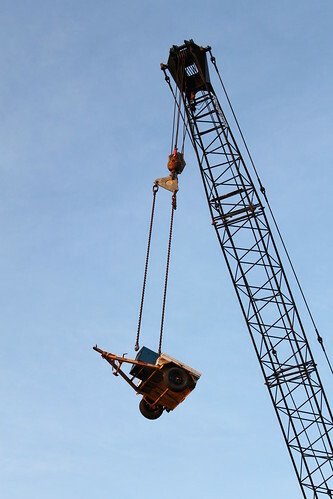 There’s a small (and uplifting) catch! 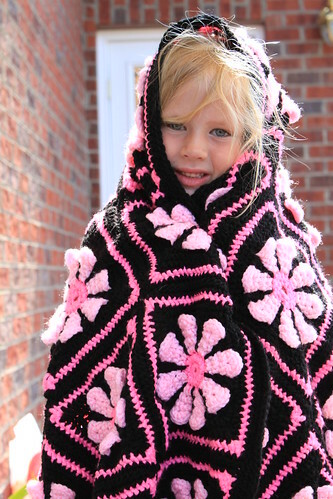 In return for the pattern, you are to crochet at least one square and mail it back. The squares are sewn together and donated to hospitals and charities in the Buffalo, New York area. The effort has quite an impressive following and daisy squares have been mailed in from all over the world! For colors, I chose black, a light pink and a bright pink. 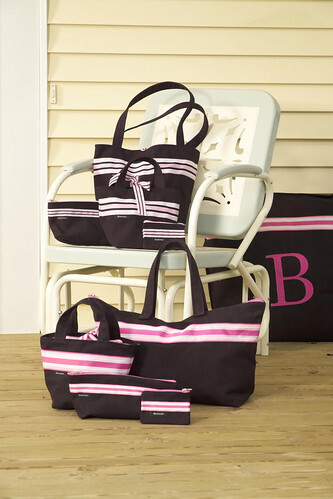 My inspiration for the color palette is drawn from one of Ann’s own classic handbag lines. I started the daisy effort in November 2009. Now my recipient was Ann. I didn’t want to just turn over anything. I had to practice first! I made seven daisies in blue. Once I was satisfied I had the hang of it, I moved on to the pink. The daisy blanket proved to be the most extensive of all our wedding DIY projects. Even near the end of the daisy effort, each square was still taking me between one and two hours. I needed forty and as time ticked by, I had to squeeze in daisy making whenever I could. I worked on daisies while we watched TV (but never during Lost– Lost required complete attention). I worked on daisies in the car. I worked on the daisies during ZJ’s Super Bowl party. 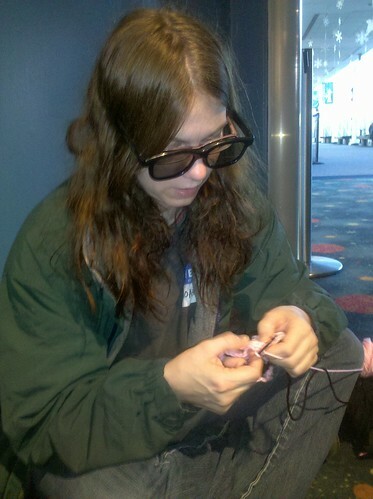 I even worked on a daisy on the floor of the Virginia Air and Space Museum while I waited to see Avatar in 3D IMAX. Crochet is like breathing to my mother and still tried and true, she volunteered to take on the less fun part. When I finished a batch of squares, I shipped them to Occoquan. 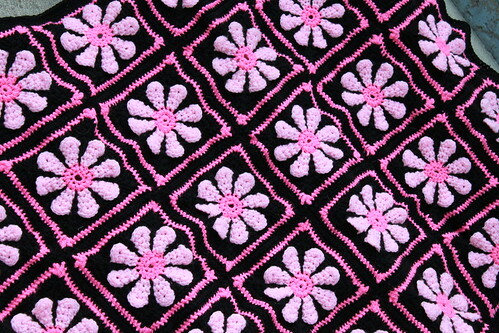 Mom would weave in the loose ends, surround each square with single crochets and stitch them together. We would send pictures of our work back and forth and it was exciting to see everything come together through team work! Alas, Mom and I still fell short of the March 20th wedding date. We had 30 daisy squares completed and 20 of them sewn together. But it was enough to present to Ann and give her a preview of what’s to come. This past weekend, I met Ann in Blacksburg, Virginia for her birthday. I was able to hand over a pot of a succulents from her bouquet (which are still growing!) 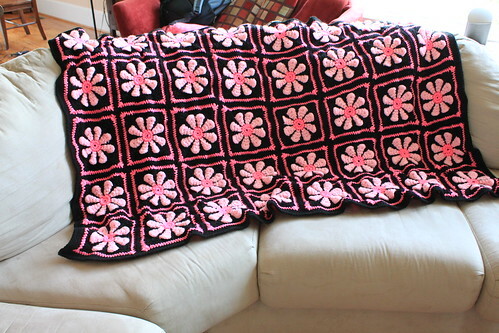 and…after seven months– the pink daisy blanket! 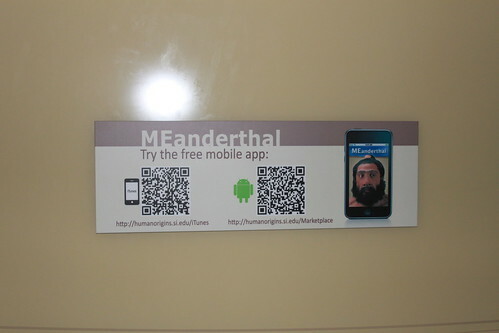 In the new Hall of Human Origins in the Smithsonian’s Natural History Museum, a lot of the displays focus on key traits and behaviors that help make us human. 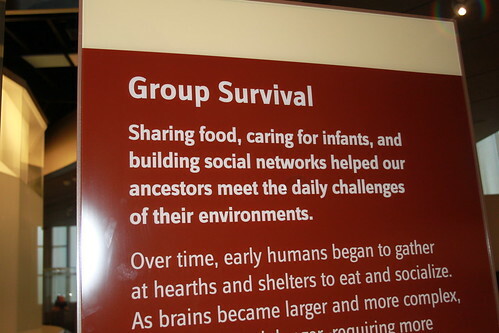 One item they highlighted was group survival and the building of social networks. Pooling resources helped us to adapt to our changing environments. 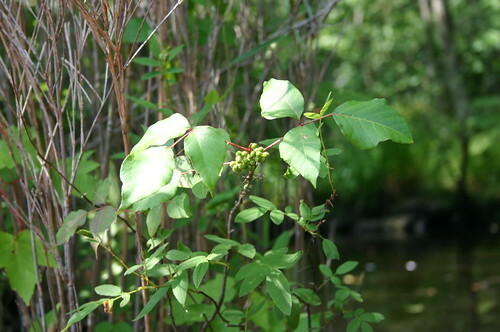 Groups also gave the young, the old and the injured a better chance at survival. 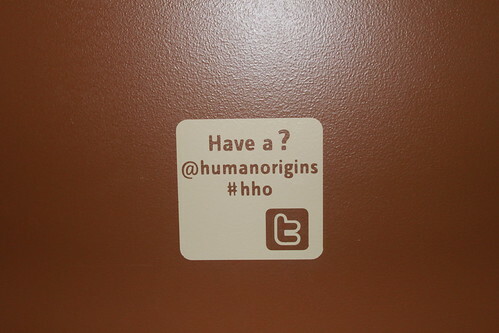 For more pictures of the Hall of Human Origins, I direct you to Ryan’s Flickr set. With 289 photos, it’s a much more comprehensive than mine. Last summer I was driving around with the dogs exploring the area around Belvidere, North Carolina when I saw a a familiar site. A trailhead! Excited about a surprise hike, I made a U-Turn and unloaded the dogs. I examined the map and sure enough there a trail. But I looked around and I couldn’t see. Perhaps it’s overgrown, I thought, so the dogs and I wandered along the perimeter of the park. Ooooh, maybe it’s across the street! With the dogs in tow, I crossed the street and checked for beaten paths. Still nothing. I went back and referred to the trail map a number of times. There was clearly a trail. Why couldn’t find it?!? It took me quite some time to realize. The trail was the water. It was a paddle trail! A year later, Ryan and I are proud owners of kayaks. Now I can finally finally explore the trail perplexed me so. Yeah! Now I can Explore the Trail! 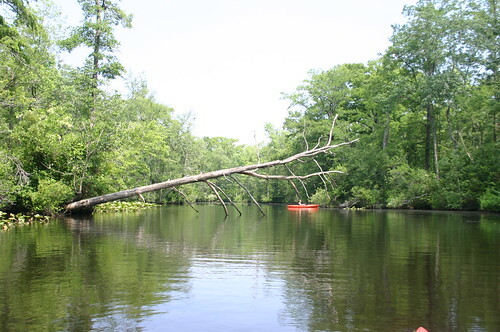 There are over 40 miles of paddle trails in Perquimans County. Ryan and I explored just part of the Lower Perquimans River Trail. 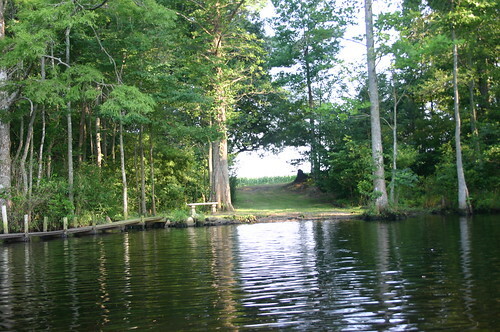 From Belvidere, it travels 12 miles down the river to the town of Hertford, North Carolina. We went down 7 of those miles and back. There were no rapids and no currents. 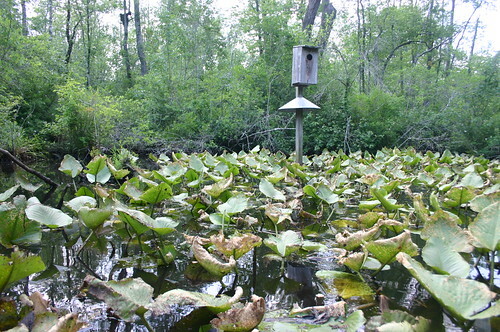 The water was still enough to support numerous lilypad communities. This was a very secluded outing. We were the only boats on this section of the river and for most part the shore was undeveloped. We saw two houses and one landowner the entire trip. 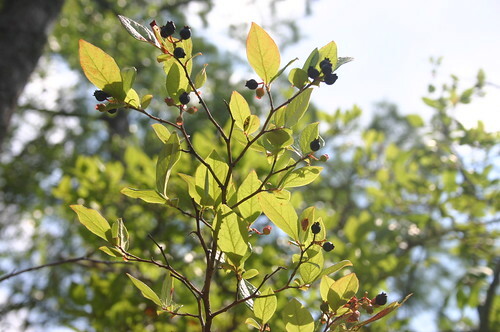 This section of the Perquimans River Trail is also considered an official birding trail and with good cause. Ryan and I were surprised to find a wild turkey high up in the trees. A giant owl crossed the river right in front of Ryan. Herons and ducks were common. 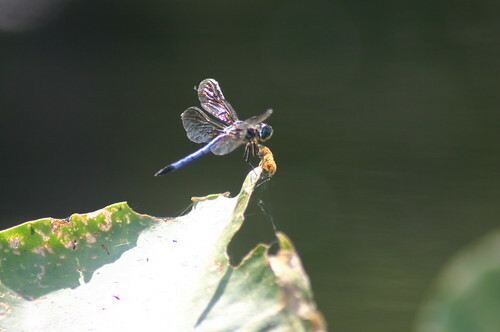 The trail could also be an official insect trail. We had some problems with biting flies. I still have itchy red bumps scattered across my body. 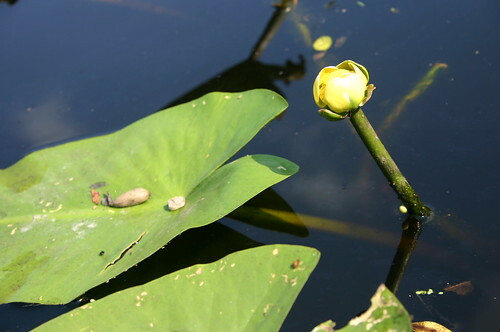 On the upside, dragonflies quite fancied all the lilypads in the river. 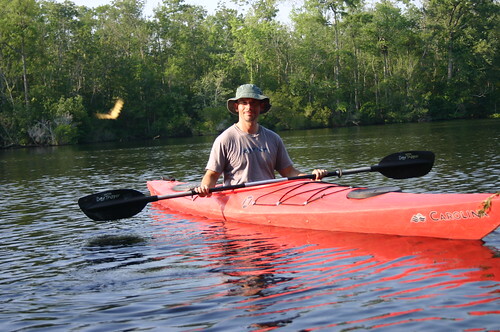 We paddled by a number of familiar faces– Red maple, Spanish Moss and the ever-prevalent Bald cypress. 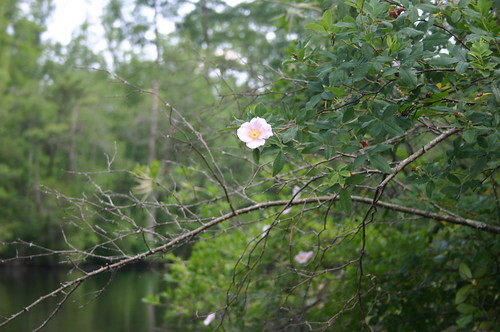 The Tupelos, Lilypads, Swamp Roses and Willow Oaks (?) were all flowering. We were pooped by the time we got back to the parking lot. But once we got our boats secured back on the car and we got back to Elizabeth City, we had a fragrant home and a hearty warm meal waiting for us. Before we left for our outing, we had loaded up some chicken in the crock pot. And that– I highly recommend. From skiing to day hikes to paddling, crock pot meals are just a wonderful way to welcome weary, tired muscles back home. 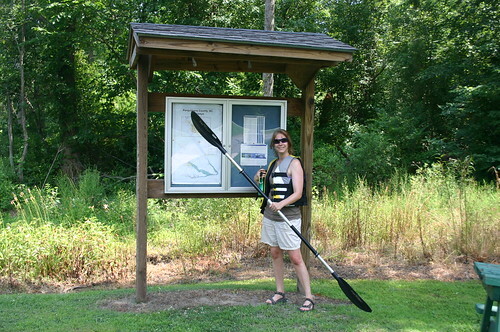 More pictures of our Lower Perquimans River Trail Outing are on my Flickr site. In about 7.5 miles you’ll pass through Belvidere. Shortly afterwards, the trailhead and parking will be on your left. 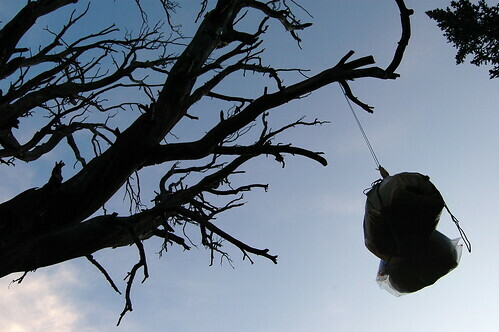 When camping, it’s a common practice to consolidate all your food in a bag and suspend it overnight high up in a tree (preferably away from your campsite). You do this in part to keep the bears from stealing your food while you sleep. Buffalo Mountain Natural Area Preserve…via Facebook! After the first annual Qualtrax’s User Conference in 2005, I went hiking with a couple of the Qualtrax customers. We went up to Mountain Lake on Salt Pond Mountain which we found snow covered in October! This year I had hoped to attend the conference and do more hiking with all the friends I had met when I worked at Qualtrax. Unfortunately, the timing didn’t work out. It was the same week as our local Relay for Life which and I had a number of obligations to attend to. She and two of the Qualtrax employees hiked Floyd County, Virginia’s Buffalo Mountain. 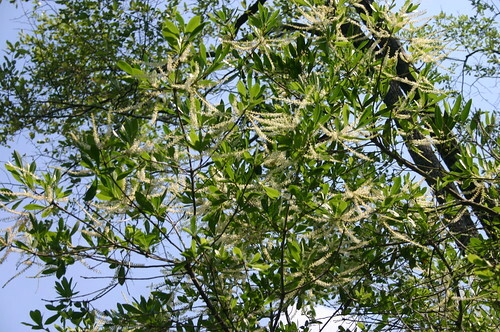 They kept their eyes open for the giant mealybug species (Puto kosztarabi) that is indigenous only to Buffalo Mountain. 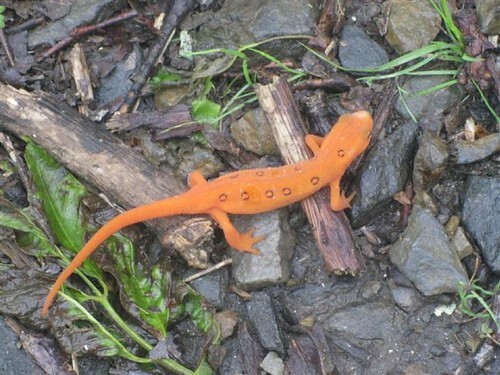 They didn’t have any spottings of that but thanks to the rainy weather, they saw plenty of red efts! As far as I know, this is the first video uploaded to YouTube with me specifically in mind (Jeremy Turner did upload a rendition of Round Here, but he said it was for his “old, old friends“).